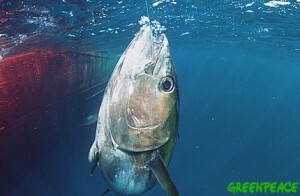 A big-eye tuna caught on a long line. In long line fishing, fish may remain captured for many hours, or even days. Long line fishing, or long lining, is a commercial fishing method that uses hundreds, or even thousands, of baited hooks hanging from a single line which may be 50-100 km long. Unlike the other hook and line fishing methods discussed, the duration of capture for long line fishing is very long. Fish caught on long lines are landed hours, or days, later when the gear is hauled up. Hooking is stressful to fish (see rod and line fishing) and can lead to severe exhaustion. It can also result in severe injury (see trolling). As with all forms of hook and line fishing, sometimes fish are gaffed (i.e. impaled on a hook) to bring them abroad. In this method of fishing, it is common for live fish to be used as bait. A semi-automatic machine impales the live fish on hooks as the line is played out. The use of live bait hugely adds to the suffering caused in this fishing method, as do long capture periods. One hooked, the fish may themselves be subsequently attacked by predators and may be dead when landed. Long lines kill sea birds, sea turtles and sharks, as well as non target fish, which are attracted by the bait. Sea birds like albatross get hooked when the lines are near the surface. The birds are then dragged under water and drowned. Bird bycatch can be reduced by measures such as bird-scaring devices and weighting the lines to make them sink more quickly. US fishermen can avoid the migratory paths of sea turtles by sinking their long lines deeper. Large numbers of bycatch fish are reportedly caught and thrown back dead. Long line fishing catches more sharks as bycatch than any other fishing method on the high seas.